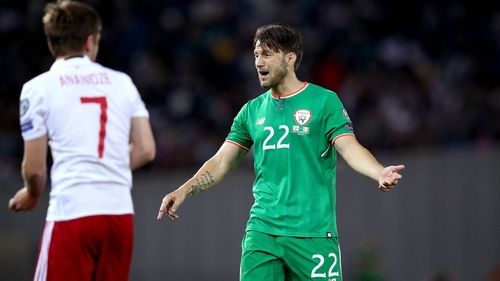 Arter declared himself unavailable for the games against Wales and Poland during this month's international break, but Republic manager Martin O'Neill is hoping for a reconciliation between the player and his number two. "Harry loves his country and wants to play for them again," Warnock said after revealing he had spoken to Arter about the incident. "Martin doesn't need me to tell him that Harry's a good player to have in the squad. "I'm sure Martin will get this sorted in the next few weeks." In the leaked audio, Ward says Keane had accused Arter and Walters of not doing enough training while the pair were relaxing and icing their legs. Keane was also alleged to have targeted Arter in another foul-mouthed outburst, claiming the 28-year-old did not want to train. Arter and Walters supposedly told Keane that they "could not train three days in a row" because they were carrying injuries and that O'Neill was aware of the situation. "The one thing you can't complain about Harry is training," Warnock said. "He trains too much and I have to curb him at times because he trains like he plays. Republic great Liam Brady criticised Keane after the Ward audio made its way into the public domain. Brady said Keane has "far too often" been the story and that Arter "was well within his rights" not to turn up for international duty after being spoken to in that fashion. But Warnock said: "When I got the sack at Sheffield United the only guy to speak to me was Roy Keane. "I'll never forget that, that was a bit of class. "He gets tainted with a lot of things and I'm not saying he's perfect because he isn't. "But I'm sure Roy will deal with this situation in the right way and in the cold light of day. "It's something which is regrettable, but I'm sure it will be ironed out in the next few weeks."